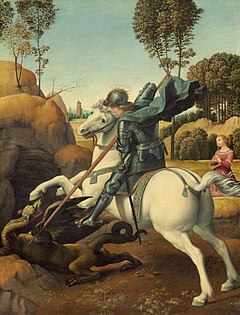 In the calendars of the Lutheran Churches, those of the Anglican Communion, and the General Calendar of the Roman Rite, the feast of Saint George is on 23 April. In the Tridentine Calendar it was given the rank of "Semidouble". In Pope Pius XII's 1955 calendar this rank is reduced to "Simple". In Pope John XXIII's 1960 calendar the celebration is just a "Commemoration". In Pope Paul VI's revision of the calendar that came into force in 1969, it was given the equivalent rank of a "Memorial", of optional use. In some countries, such as England, the rank is higher. Since Easter often falls close to Saint George's Day, the church celebration of the feast may be moved from 23 April: For 2011 and 2014 the Lutheran, Anglican and Catholic calendars celebrated Saint George's Day on the first Monday after the Octave of Easter (see Easter Week) (2 May 2011 and 28 April 2014, respectively). Similarly, the Eastern Orthodox celebration of the feast moves accordingly to the first Monday after Easter or, as it is sometimes called, to the Monday of Bright Week. The church celebration may also be moved if the 23rd April falls on a Sunday; in England and Wales the Catholic calendar celebrates Saint George on Monday 24 April 2017 (because Sunday is the celebration of Christ's Resurrection, which is far more important than any saint's commemoration). Besides the 23 April feast, some Orthodox Churches have additional feasts dedicated to St George. The country of Georgia celebrates the feast of St. George on 23 April and, more prominently, 10 November (Julian calendar), which currently fall on 6 May and 23 November (Gregorian calendar), respectively. The Russian Orthodox Church celebrates the dedication of the Church of St George in Kiev by Yaroslav the Wise in 1051 on 26 November (Julian calendar), which currently falls on 9 December on the Gregorian calendar. Flag of England. (St George's Cross). The earliest documented mention of St. George in England comes from the Catholic monk the venerable Bede (c. 673–735). His feast day is also mentioned in the Durham Collectar, a ninth-century liturgical work. The will of Alfred the Great is said to refer to the saint, in a reference to the church of Fordington, Dorset. At Fordington a stone over the south door records the miraculous appearance of St. George to lead crusaders into battle. Early (c. 10th century) dedications of churches to St. George are noted in England, for example at Fordingham, Dorset, at Thetford, Southwark and Doncaster. In the past, historians mistakenly pointed to the Synod of Oxford in 1222 as elevating the feast to special prominence, but the earliest manuscripts of the synod's declaration do not mention the feast of St George. The declarations of the Province of Canterbury in 1415 and the Province of York in 1421 elevated the feast to a double major, and as a result, work was prohibited and church attendance was mandatory. Edward III (1327–1377) put his Order of the Garter (founded c. 1348) under the banner of St. George. This order is still the foremost order of knighthood in England and St George's Chapel at Windsor Castle was built by Edward IV and Henry VII in honour of the order. The badge of the Order shows Saint George on horseback slaying the dragon. Froissart observed the English invoking St. George as a battle cry on several occasions during the Hundred Years' War (1337–1453). Certain English soldiers also displayed the pennon of St George. St George's Day was a major feast and national holiday in England on a par with Christmas from the early 15th century. The tradition of celebration St George's day had waned by the end of the 18th century after the union of England and Scotland. Nevertheless, the link with St. George continues today, for example Salisbury holds an annual St. George's Day pageant, the origins of which are believed to go back to the 13th century. In recent years the popularity of St. George's Day appears to be increasing gradually. BBC Radio 3 had a full programme of St. George's Day events in 2006, and Andrew Rosindell, Conservative MP for Romford, has been putting the argument forward in the House of Commons to make St. George's Day a public holiday. In early 2009, Mayor of London Boris Johnson spearheaded a campaign to encourage the celebration of St. George's Day. Today, St. George's day may be celebrated with anything English including morris dancing and Punch and Judy shows. A traditional custom on St George's day is fly or adorn the St George's Cross flag in some way: pubs in particular can be seen on 23 April festooned with garlands of St George's crosses. It is customary for the hymn "Jerusalem" to be sung in cathedrals, churches and chapels on St George's Day, or on the Sunday closest to it. Traditional English food and drink may be consumed. There is a growing reaction to the recent indifference to St George's Day. Organisations such as English Heritage and the Royal Society of St George have been encouraging celebrations. There have also been calls to replace St. George as patron saint of England on the grounds that he was an obscure figure who had no direct connection with the country. However, there is no obvious consensus as to whom to replace him with, though names suggested include Edmund the Martyr, Cuthbert of Lindisfarne, or Saint Alban, with the last having topped a BBC Radio 4 poll on the subject. Recently there have been calls to reinstate St Edmund as the patron Saint of England as he was displaced by George some 400 years ago. Religious observance of St George's day changes when it is too close to Easter. According to the Church of England's calendar, when St. George's Day falls between Palm Sunday and the Second Sunday of Easter inclusive, it is moved to the Monday after the Second Sunday of Easter. In 2011, for example, 23 April was Holy Saturday, so St George's Day was moved to Monday 2 May. The Catholic Church in England and Wales has a similar practice. 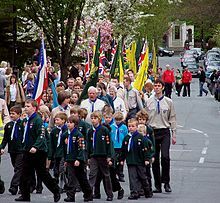 The Scout movement has been celebrating St George's Day on 23 April since its first years, and St George is the patron saint of many other organisations. St. George's Day is celebrated on 23 April. St. George's Day is not an official national holiday in Canada. It is, however, a provincial holiday in Newfoundland and Labrador, where it is usually observed on the Monday nearest 23 April. In sport, April 23 is also the anniversary of the St George Dragons Rugby League Football Club. The St George club coincidentally played their inaugural New South Wales Rugby League first grade match on St George's Day, 23 April 1921 at the Sydney Sports Ground in Australia. In the Czech Republic, Saint George's Day (svátek sv. Jiří) comes on 24 April. The reason why it was moved from 23 April is, that there is a day of St. Adalbert of Prague (in Czech Svatý Vojtěch), Czech national patron saint, who was martyred on 23 April 997. It is celebrated in a special way. As in the rest of the historical territory of the Crown of Aragon, the Feast of St George is celebrated enthusiastically in the Community of Aragon, being the country's patron saint and its national day. On 23 April, Aragon celebrates its "Día de Aragón" (Day of Aragon) in commemoration of the Battle of Alcoraz (Baralla d'Alcoraz in Aragonese), on which Huesca was conquered by the Aragonese army and in which tradition says that St George appeared at a critical moment for the Christian Army. 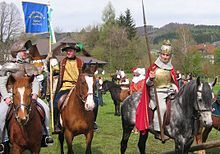 In tradition-rich Buttenheim, Georgiritt takes place on 23 April and leads from Gunzendorf up onto the Senftenberg. This is a kind of pilgrimage traditionally done on horseback. If St George's Day (or any saint's day) falls during Holy Week or on Easter Day, it is observed on Easter Monday. The Russian Orthodox Church, which uses the Julian calendar, has two important feasts of Saint George. Besides the feast of 23 April (6 May in the Gregorian calendar), common through all Christendom, Russians also celebrate the anniversary of the dedication of the Church of St George in Kiev by Yaroslav the Wise (1051) on 26 November (Julian Calendar), which currently falls on 9 December. One of the Russian forms of the name George being Yuri, the two feasts are popularly known as Vesenniy Yuriev Den (Yuri's Day in the Spring) and Osenniy Yuriev Den (Yuri's Day in the Fall). In Serbian, St George's Day is called Đurđevdan (Cyrillic: Ђурђевдан) and is celebrated on 6 May every year, as the Serbian Orthodox Church uses the Julian, Old Style calendar. St George's Day is one of the most common Slavas (family patron day) among the Serbs. Đurđevdan is also celebrated by both Orthodox and Muslim Romani and Muslim Gorani. Đurđevdan is celebrated, especially, in the areas of Raška in Serbia. Apart from being the Slava of many families, St George's Day is marked by morning picnics, music, and folk dances. Possibly the most celebrated name day in Bulgaria, St George's Day (Гергьовден, Gergyovden) is a public holiday that takes place on 6 May each year. A common ritual is to prepare and eat a whole lamb, which is an ancient practice possibly related to Slavic pagan sacrificial traditions and the fact that St George is the patron saint of shepherds. It is also believed to be a magical day when all evil spells can be broken. It was believed that the saint helps the crops to grow and blesses the morning dew, so early in the morning they walked in the pastures and meadows and collected dew, washed their face, hands and feet in it for good luck and even in some rural parts of Bulgaria it was a custom to roll in it naked. St George's Day is also Bulgarian Armed Forces Day, made official with a decree of Prince Alexander of Battenberg on 9 January 1880. Parades are organised in the capital Sofia to present the best of the equipment and manpower of the Bulgarian military, as well as in major cities nationwide. St George's Day is also called Đurđevdan and is celebrated by Bosnian Serbs and Romani (both Orthodox and Muslim), but also has been celebrated by the other ethnic groups in Bosnia and Herzegovina. Đurđevdan's widespread appeal can be seen in the folk song Đurđevdan popularised by Bijelo Dugme as well as Meša Selimović's novel Death and the Dervish. Veneration of St George as a martyr originates in the Levant, spread from Palestine through Lebanon to the rest of the Byzantine Empire – though the martyr is not mentioned in the Syriac Breviarium – and Georgia in the 4th to 5th centuries. In Georgia, the feast day on 23 November is credited to Saint Nino of Cappadocia, who in Georgian hagiography is a relative of St George, credited with bringing Christianity to the Georgians in the fourth century. A titular church built in Lydda during the reign of Constantine the Great (reigned 306–37) was consecrated to "a man of the highest distinction"; the identity of this man with St George was asserted by the 7th century. The church was destroyed by Muslims in 1010, but was later rebuilt and dedicated to Saint George by the Crusaders. In 1191 and during the conflict known as the Third Crusade (1189–92), the church was again destroyed by the forces of Saladin, Sultan of the Ayyubid dynasty (reigned 1171–93). A new church was erected in 1872 and is still standing. 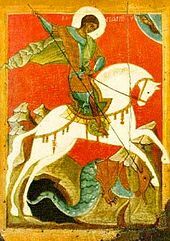 Christians in the Middle East continue to celebrate St George's Day, and the custom has been adopted in Muslim tradition via identification of the saint with the figure of Al-Khidr and an association in folk belief with medicine and healing. In Palestinian culture, the feast is held on 5 May. The feast is held in the Palestinian town of al-Khader, just south of Bethlehem. Historically, the feast attracted Arabs from throughout Palestine to visit the Monastery of Saint George. On the morning of 6 May, Palestinian Christians from Beit Jala, Bethlehem, Beit Sahour and other parts of Palestine would march in a procession to the monastery. The play Jerusalem (2009) by Jez Butterworth takes place on St George's Day, 23 April, also the day of death and estimated birth day of William Shakespeare. Wikimedia Commons has media related to Saint George's feasts. ^ "Dracula - It is the eve of St George's Day - Book Drum". www.bookdrum.com. Archived from the original on 15 August 2017. Retrieved 23 April 2018. ^ Roeber, A. G. (7 April 1998). Palatines, Liberty, and Property: German Lutherans in Colonial British America. Taylor & Francis. p. 34. ISBN 9780801859687. ^ "Agios Georgios Feast in Greece". Greeka. 25 April 2016. Retrieved 20 April 2018. Agios Georgios is an acknowledged saint across the Catholic, the Anglican, the Orthodox, the Lutheran and the Armenian Church. In Greece, Saint George is celebrated on the 23rd of April and many areas of Greece devote big ceremonies and fairs to his name that aim at reassuring the Saint's blessings. ^ Williams, Steven. "Dragons - Our Proud History - St George and Illawarra Rugby League". jubileeavenue.com.au. Retrieved 23 April 2017. ^ "Georgia celebrates its national holiday—St. George's (Giorgob) Day / OrthoChristian.Com".